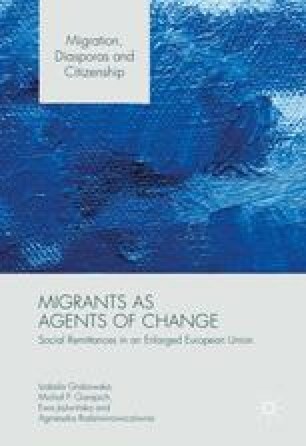 In the introductory chapter we set the scene of social remittances in an enlarged European Union (EU). We relate here to the migration-development nexus and the roles of social remittances within that. We also check for validity of this migration-development reasoning for the “new” EU countries that are all classified as “developed economies”. Then we characterise the aims of the book and briefly sketch a picture of post-accession migration as based on the migratory flows between Poland and the UK. In this chapter we also formulate research questions and announce the methodological approach based on transnational multisited longitudinal research. White, A. (2016). Social remittances and migration (sub)-cultures in contemporary Poland. Central and Eastern European Migration Review March 14 (pp. 1–17). 10.17467/ceemr.2016.04.